While it’s debatable if the credits should be given to the massive returns or the approaching SummerSlam PPV, WWE was able to prove why Raw is their flagship show once again this week as the program saw a significant increase in viewership. This week’s episode of Monday Night Raw drew an average of 2.901 million viewers which is up 4.4% from the 2.779 million viewers the show did last week. The episode featuring the return of Brock Lesnar and Ronda Rousey did its best numbers since the Money In The Bank follow up episode on June 18th which was almost one and a half month ago. Not only that but Raw was #1 for the night in viewership on cable and #1 in the 18-49 demographic as well. This apparently was the first time the Red Branded Show was #1 on cable since its August 29th episode last year. Though it’s worth mentioning here that despite the fact that the company was building a main event segment featuring Brock Lesnar throughout the episode, the audience still dropped for the third hour of Raw. The second hour of the show had drawn 3.012 million viewers, which was a significant increase from the 2.875 million viewers of the first hour. 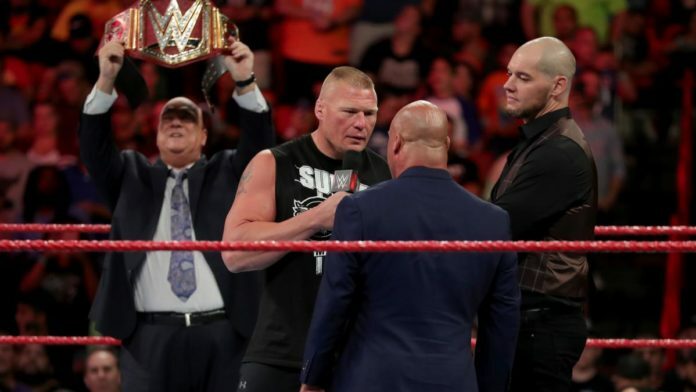 However, the third hour of the show, featuring the Lesnar segment couldn’t continue the momentum and the audience for it dropped to 2.815 million viewers.